We know that once we have an opportunity to show you what we can do for your marble and other natural stone, as well as your tile & grout, you will become our customer for life. And because we value this relationship so much, we’re willing to make it worth your while to let us show you what we can do. 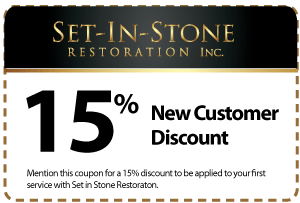 Just mention this coupon and we will apply the 15% discount to your first time service with us. No strings, no gimmicks. Just a genuine desire to have you as a customer.